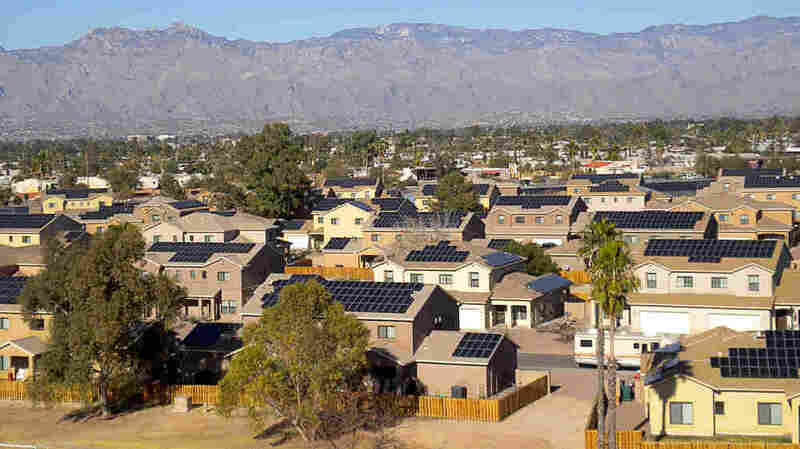 Solar Project Moves Forward Without Uncle Sam SolarCity says it will install solar systems on the roofs of up to 120,000 military homes, with financing coming from Bank of America Merrill Lynch. It's the first time a project of this scale has been launched without the federal government basically co-signing the loan. We've heard a lot about Solyndra, a solar panel maker that went bankrupt despite lots of federal subsidies. But on Wednesday, a solar installation company and one of the country's biggest banks announced a billion-dollar project to put solar systems on the roofs of military housing. And they're doing it without the kind of federal help Solyndra got. When SolarCity CEO Lyndon Rive came up with a plan to put solar on the rooftops of military housing around the country, he was sure he'd need federal backing to get loans for such a big project. But after his company and the Department of Energy missed a deadline to get that help, SolarCity and its lender, Bank of America Merrill Lynch, didn't give up. Now they're announcing a deal to install solar systems on up to 120,000 military homes. "It will be the largest residential deployment of solar in American history," says Rive. The deal signals that companies are finally finding a way around what has long been one of the biggest obstacles to broader adoption of solar power — inadequate financing. "There really weren't a lot of financing tools available, so it was done one rooftop at a time," said Jonathan Plowe, who heads up the new energy team at Bank of America Merrill Lynch. 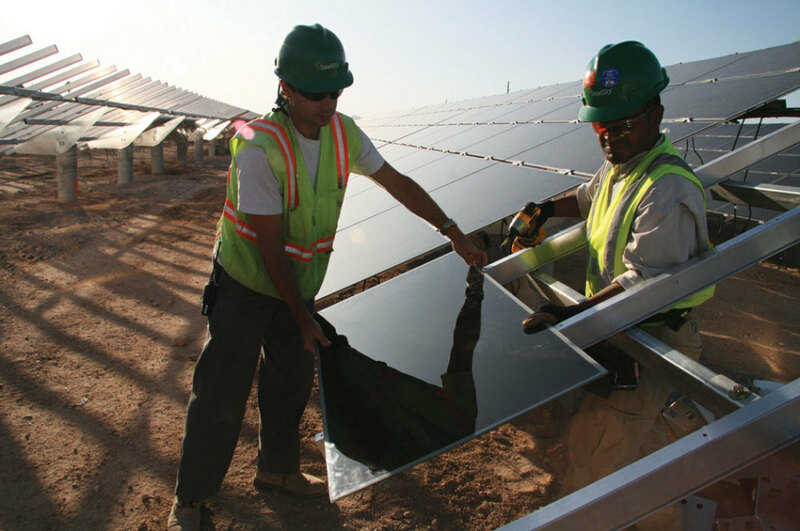 Workers install solar panels at the Soaring Heights Communities at Davis-Monthan Air Force Base outside Tucson, Ariz. He says the real breakthrough represented by his company's agreement with SolarCity is that it puts long-term financing in place for so many installations. It's the first time a project of this scale has been launched without federal loan guarantees. That's when the government lowers the risk for lenders by basically co-signing the loans. Even without loan guarantees, solar projects still get tax credits and other subsidies. Plowe says there's lots of demand for rooftop solar, so his Bank of America team plans to do more of these projects. "As the costs of the systems continue to come down and the cost of the capital continues to come down, the industry will be able to continue to grow," says Plowe. Bank of America will provide up to $350 million, so SolarCity will need to attract additional investors for what it hopes will be a $1 billion project. SolarCity will install and own the solar systems and sell the electricity to the private companies that manage military housing at a discount of about 10 percent compared with utility prices, according to the company. It's a business model that now dominates the solar industry. The lender gained confidence that SolarCity was a good bet because of the work it had done on earlier projects. The company installed solar systems at Davis-Monthan Air Force base in Tucson, Ariz., and it is working on a project at the joint Navy-Air Force Base Pearl Harbor-Hickam near Honolulu. Rive says by installing lots of solar panels in one area, the company has shown it can save money and turn solar power into a reliable business. "It worked extremely well. It also allowed us as a company to get economies of scale on a concentrated area," Rive said. "There's a lot of inefficiencies when you have to go back and forth to different homes in different communities." Lend Lease, the company that manages the housing at both bases, says it's saving lots of money that it can use to build more housing and update existing units. Lend Lease manages 40,000 housing units at 21 military bases around the country. It's planning to do more solar projects, including some with SolarCity. "They've demonstrated that they can get extremely competitive pricing for solar. So who wouldn't do it if you could save money and you could get the green benefits of doing that?" says Simon Muir, a vice president of Lend Lease. The solar installation industry in the U.S. has doubled in each of the past two years, according to Rhone Resch, who heads the Solar Energy Industries Association. "The fact that SolarCity is now able to attract money, I think, really demonstrates how mainstream solar has become, how confident investors are in both the technology, its performance and its returns," Resch says. Solar still only provides a tiny portion of U.S. electricity, and it has not yet taken off as a major electricity source. But Mark Bachman, an analyst specializing in the solar industry for the investment banking firm Avian Securities, is more cautious. "I think it's gaining momentum. I wouldn't call it a breakthrough time in the U.S.," he says.